This week, I have been totally obsessing about this watch. I thought initially it was a men’s watch but the case is 43 mm (which seems ok for women) + it’s called “Bradshaw” which I suspect can only be a reference to Carrie. Even if it had been for a watch for men, I was ok with it. I like wearing big watches. They make my wrist look smaller and its a bit like my Isabel Marant sneakers, they are quite big (and comfy) but they also make my legs look slimmer. Anyway, Nordstrom who normally ship things to the UK, does not ship this watch! 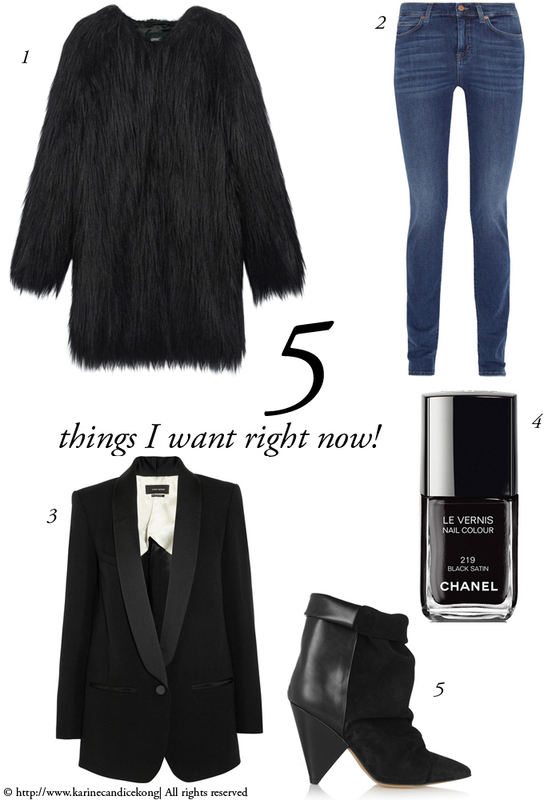 Seriously…I spent hours trying to find it on a UK website so until I succeed here are 5 things I want right now! 1/THIS jacket! Seriously…I thought I had seen all the best pieces from the Hush AW14 collection but this new coat is just screaming…pick me, pick me! 2/ Worn with a pair of skinny jeans from MIH jeans, it will be per-fect! 4/ and it was when I was getting ready for the Awards that I realised that my sweet 9 years old had gone back to France with pretty much all my nail varnishes so we will have a little chat next week but in the meantime, I got myself this gorgeous black nail varnish by Chanel. 5/ last but not least….I want/need/crave these Isabel Marant boots…just gorgeous! What piece do you love the most? What about all the Nixon watches? They have some very cool black ones i think you’d love. Pingback: Bodie and Fou: 5 THINGS I WANT RIGHT NOW!